In just his sophomore season with the team, Jim Tressel made all of college football aware of the power of the sweater vest. 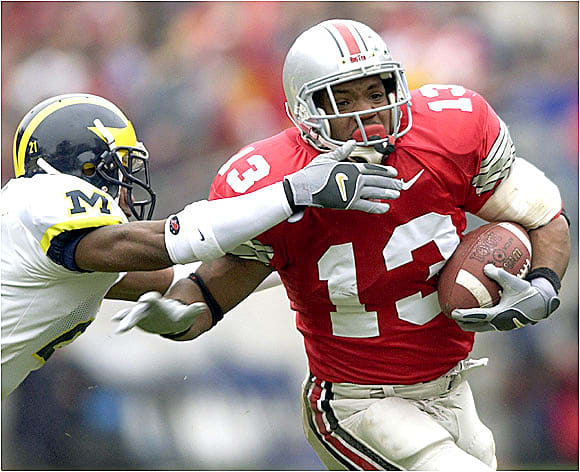 The Buckeyes had anything but a dominating season, but with a little help from freshman Maurice Clarett, OSU went undefeated, tying the record of most wins (14) in a season and winning the chip against highly-favored defending champ Miami at the Fiesta Bowl. At the time Clarett's game-winning touchdown in the national championship game against the U seemed to be a sign of the bright future ahead of him. Seriously, who thought Craig Krenzel would have the more illustrious NFL career?